Andrew Bolton, Tom Cornford, Duncan Law, James Rayment. Four soldiers are held captive in a church in an unknown country. In their sleep they dream they are characters from the Old Testament. The passions, moral dilemmas and sacrifices of each Biblical figure speak through the men with truly haunting power, and the hidden truths and fears of the soldiers' own hearts are revealed to us. In 2001 we toured A Sleep of Prisoners , by our much-loved patron Christopher Fry, to twelve churches. Our production marked the play's 50th anniversary, and visited the University Church of St Mary the Virgin, where it was first performed in 1951. 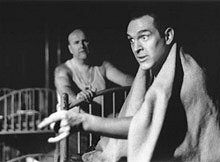 As far as we know ours was the first professional revival of the play to be performed in churches (as the author intended) since the original production, which toured for two years with Denholm Elliot and Stanley Baker in the cast. We worked closely with Christopher Fry and with two members of the original company of A Sleep of Prisoners, Leonard White and Hugh Goldie, who saw the show on its opening night and gave it their hearty recommendation. As part of their preparation for their roles, the four actors met former prisoners of war, and researched the experiences of imprisoned soldiers. You can see some of the original WWII photos of prisoners that the company came across during their research. Christopher Fry with the cast of A Sleep of Prisoners. 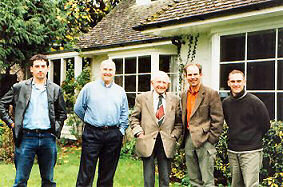 From left to right: Tom Cornford, Andrew Bolton, Christopher Fry, Duncan Law and James Rayment. From an open letter to Robert Gittings from Christopher Fry, 1951: "We were talking even then, as we are talking, with greater instancy, now, of the likelihood of war. And I think we realized then, as we certainly now believe, that progress is the growth of vision: the increased perception of what makes for life and what makes for death. I have tried, as you know, not altogether successfully, to find a way for comedy to say something of this, since comedy is an essential part of men's understanding. In A Sleep of Prisoners I have tried to make a more simple statement, though in a complicated design where each of the four men is seen through the sleeping thoughts of the others, and each, in his own dream, speaks as at heart he is, not as he believes himself to be. In the later part of Corporal Adam's dream the dream changes to a state of thought entered into by all the sleeping men, as though, sharing their prison life, they shared, for a few moments of the night, their sleeping life also."